This Giant Gourmet Fortune Cookie weighs in at just under 1 pound and is almost the size of a football! This adorable cookie is first hand dipped in Belgian white Chocolates and is decorated for Easter with 100% Hand Made Royal Icing Decorations...Then, our confectionary artisans finish it with delightful pastel Candy Easter Confetti! This beautiful and delicious cookie will quench their spring fever for sure...it's a perfect Gift and Greeting All In One! Personalize the foot-long fortune inside up to 10 lines! 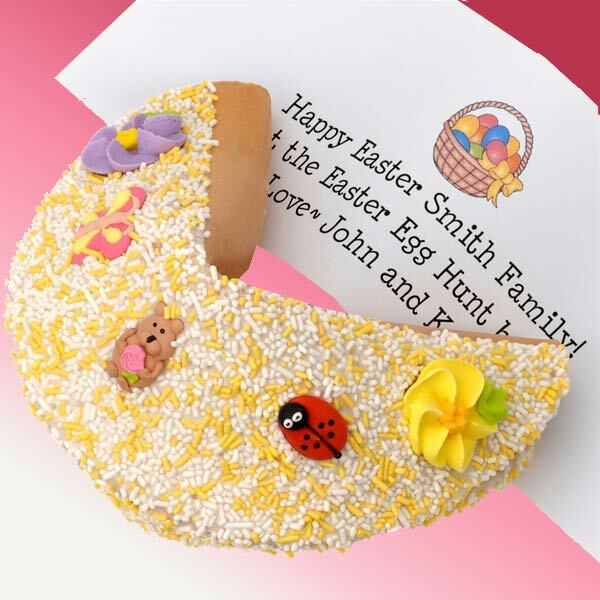 We guarantee you that this is one of the sweetest---and most memorably clever ways of celebrating Spring or Easter!